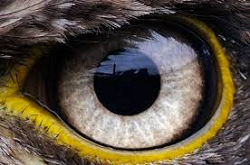 Welcome to The Predator’s Eye Products—your source of information about infrared technology and products that may help you. Infrared heating is used in household products including room heaters and plug in fire places that flicker. Saunas also use infrared heat. Infrared heaters are also common for industrial use such as portable infrared heaters from BBC Industries to speed up commercial printing as it dries ink faster than just circulating air. There are many ways IR technology can be used to improve industrial, scientific and agricultural processes and this site is replete with such examples. But what about recreation? Can IR be used simply for the fun of it? The innovative tech company GoPro answers this question with a resounding "yes!" The HERO4 Black camera retails for $499 and features high resolution at 4 times the 1080p standard available on fully HD televisions. But what makes this high impact camera exceedingly fun is its IR lense complete with a 160 degree field of vision. If you're wanting to film in the dark or perhaps make a scary movie with lots of night scenes, you're going to want an IR camcorder. The Cleveland Paranormal Supply Company is happy to sell you one for $269. With the push of a button, the camcorder toggles between standard and IR/Full Spectrum Mode. Not only are these products great for viewing and photographing or filming night skies (imagine the Northern Lights in IR mode) and landscapes, they can also be used for activities that are exploding in popularity like night time scavenger hunts, night wilderness exploration and amateur movie making. What fascinating and surprising discoveries could you make with your IR camera or camcorder when you venture into the woods for a nocturnal adventure? Another use has been adopted by some outdoors enthusiasts—night hunting. Although this activity increases the typical dangers hunters encounter in the daytime, using a thermal camera evens the odds and allows this recreational practice to take on added excitement once the sun goes down. Now you too can hunt the forests of the night much as our alien visitor in Predator movies. At last, now I can take great thermal pictures with my phone! According to GIZMODO, Bullitt Group, a British company based in Reading, UK, west of London, has built the world's first smartphone with a built-in thermal imaging camera. While other companies have produced peripherals that can be added onto an existing smartphone camera, this is the first one to actually integrate the IR technology into a smartphone camera itself. 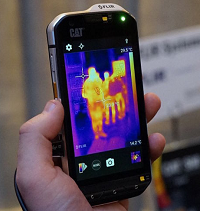 Retailing for $599, the Cat S60 smartphone will feature a thermal camera using IR technology. The camera is manufactured by the US company FLIR. FLIR has been building products with IR technology since its founding in 1978. The primary market for the Cat S60 at this point will be industrial customers and is being marketed to both first responders and manufacturers alike. This particular model, for example, is branded specifically for US industrial giant Caterpillar. It even comes with a durable case that can withstand falls of 6 feet and resists water when submerged to a depth of 15 feet. The Cat S60 can also be of use to firefighters as it is both portable and able to see through smoke; also of note, it is able to identify hot spots in order to avoid fires when entering a burning building. For police, the camera would be able to see through walls and other obstacles in order to determine the number of suspects in a hostage situation or victims who need to be rescued from any number of potential threats. Because it is integrated with a phone—something virtually everyone has these days—it can be anywhere a first responder is. While early adopters will probably heavily favor industrial and public safety interests, Bullitt predicts that in five years, some 50% of all smartphones will come with thermal cameras. By that time, who knows what new uses will be found to take advantage of this fascinating technology? Psalm 104 says that God made wine to cheer men's hearts. It seems that many Americans are looking to have their hearts cheered. According to recent surveys, a vast majority of Americans 18 and older have consumed alcohol at some time in their lives. Over 56% have consumed alcohol in the past month. Fortunately, most people use alcohol responsibly. Because it is a drug, alcohol can produce mind altering effects on a person, impairing their ability to think, reason, remember and to control their motor skills. This can be a concern when a person's job requires that he or she be in full command of all their physical and cognitive abilities. One company, TruTouch Technologies, has created a safe, effective and noninvasive way for employers to ensure their employees are not under the influence of alcohol. The TruTouch device, "uses [near infrared] light to measure a subject's alcohol level without collecting bodily fluids or other invasive means. A user places a finger on a fiber optic touchpad that analyzes the alcohol concentration in the user's body and at the same time identifies the user." According to the company, the results are virtually instantaneous and come with a biometric identification system that ensures that the correct results are logged for each user. This allows the test to be self-administered with the results automatically uploaded to an encrypted network. The potential customers and users for this technology include law enforcement for DUI checks, bars and restaurants that sell alcohol, employers who have concerns about the behaviors of their employees, point of sale locations at stores that sell alcohol, Human Resources departments for use during a hiring process, and courts and probation offices that monitor alcohol use as part of their regular duties. This is just one more example of the myriad ways that infrared technology is making the world safer and more productive for everyone. The other day, as I was about to prepare dinner, I realized that I had forgotten to thaw my pork chops. I had two choices—either have something else for dinner or try to defrost it in the microwave. As I have not had good luck defrosting meat (it turns out either cold in places or actually starts to cook but unevenly), I left the meat in the freezer and had a less healthy processed meal. What if I could have put my frozen meat in the oven, and as a bonus, it cooked in half the time of a conventional oven with no need to preheat the oven and includ energy savings too? Infrared technology makes this dream a reality. Hearthware has invented an infrared oven that can do just that. 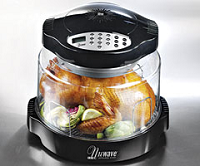 Called NuWave Oven, this countertop appliance uses infrared radiation (heat) to cook food from the inside. Consumer Reports tested their statement of a frozen chicken from your freezer to your table in fifteen minutes with excellent results. As opposed to conduction which applies heat from the outside or convection which heats the air around the food, infrared heat actually penetrates the food, allowing it to cook much faster and more evenly. More specifically, when infrared waves come into contact with organic material (like food), they are able to move the individual molecules which causes heat. Nature itself seems to prefer this form of heating as some 80% of the sun's rays are infrared. Infrared technology once again has the potential to improve virtually every area of our lives. Look for even more dramatic examples of this as infrared technology develops and improves. Everyone loves a great backyard cookout: the smell of freshly cut grass, green leaves rustling in the wind, the shouts of kids jumping in the pool or pelting each other with water balloons. But all of this would be empty without the trusty old barbecue grill. In the olden days, this meant loading up the grill with charcoal and honing the art of making the briquettes heat up—which could take a while and make dinner time more, shall we say, unpredictable. Thank God we live in the 21st century and have access to electric powered thermal grills! As noted elsewhere on ThePredatorsEye.com, cooking with infrared allows food to be heated more evenly and quickly because it is the organic matter (the food) that is heated, as opposed to the air in conduction which applies heat from the outside or convection which heats the air around the food. But isn't part of the fun of grilling meat, the look and taste that comes from a nice sear? Sure is, and because these grills use ceramic plates as a heat source, they are able to sear the meat upon contact. Looks like they think of everything. But wait, there's more! 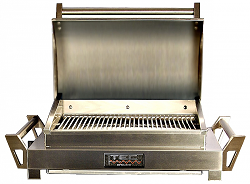 Infrared grills heat up faster and utilize less energy and gas than traditional gas grills, saving you money. 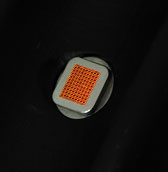 The design of infrared grills places the heating device below the ceramic element, creating a more even heat, meaning less hot and cold spots for more consistent grilling results. Infrared heating means the heat is sent directly to the food. This allows you to grill with the lid open and watch your food cook without the fear of losing precious heat. With infrared, juices drip directly on to the burner and vaporize instantly, meaning less flare-ups while grilling. 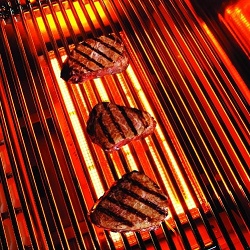 The high heat from infrared burners sears foods more quickly, locking in juices for tastier meats. With less time spent standing next to the grill, you can make grilling an everyday event— not just a weekend luxury. Because they take less time to heat up and grill foods, infrared grills are an energy efficient option over convection gas and charcoal grilling. 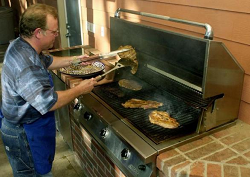 Infrared grills are easy to clean, by simply turning the temperature to high. This will sear any food particles and residue for a quick and easy clean-up! Who doesn’t love rotisserie chicken—slowly roasted over a fire, or in this case, an infrared heat plate? As the meat turns on the spit, it is cooked alternately (even periods of heat and cooling), leaving much of the tenderness, juiciness and flavor intact. This accessory can be either free standing next to the grill or actually mounted on it. And as the name indicates, its function is to sear your meat using an infrared ceramic plate. Searing stations add a hint (or more if desired) of charred meat flavor favored by many carnivores, and brings drama and spectacle to any outdoor cookout! Give you an update of the many products that use infrared and thermal imaging. Please contact us to offer stories, information, and different ways that may help share information about thermal imaging. Send mail to ThePredatorsEye@gmail.com with questions or comments about this web site.